The Templates Tab lists all the templates and template folders that you can access from your account. Folders have a folder icon next to them, to differentiate them from templates. To create a new template, click the Create Template button in the upper right. To create a new template folder, click the New Folder button in the upper right. To edit a template, click on that template’s name in the list. To view the templates inside a template folder, click that folder’s name. To search for a template by name, use the Search Bar at the top. You can use any substring of a template's name to find it. Note that searching within a specific folder will only search for templates within that folder, whereas searching at the top level will search all folders. To the right of each template/folder name is the [...] Actions dropdown, which contains a set of actions that you can perform on that item. Click on the action name in the table below to learn more about that action. The New Form, Public Share and Duplicate actions are available only for templates; the Edit and Delete actions are available for both templates and folders. New Form: Create a new form based on this template. Public Share: Share this form template to an external user via a Public Share URL. Edit (For templates): Edit this template in the Template Editor. Edit (For folders): Edit this folder’s name and permissions. Duplicate: Create a copy of this form template and save with a different name. Delete: Delete this form template or template folder. There are two actions that can be performed on multiple templates at once — Delete and Move. The former will delete several templates at once, and the latter will move several templates into a template folder. 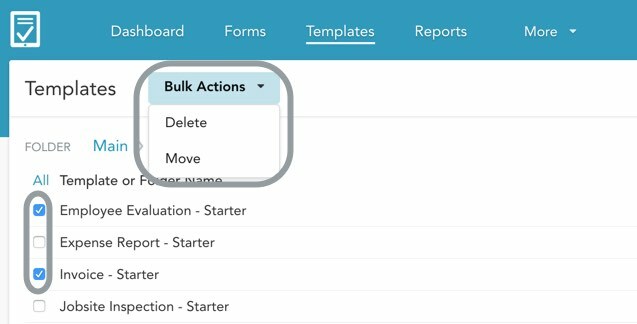 To use these bulk actions, check the boxes to the left of your template names. The Bulk Actions menu will appear at the top. Select Delete or Move from the menu to perform the associated action. Note that these bulk actions can only be performed on templates, not on template folders.